Everyone loves putting up lights not just around their Christmas tree, but also around their home during the holidays. 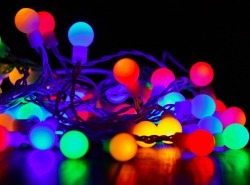 Those old-school Christmas lights stuffed in a cardboard box from many years ago may seem like a good idea – until half of the strand mysteriously won’t light. But don’t fret, there are better and more energy-efficient options out there today. LED lights are the perfect substitute for the old, inefficient incandescent lights you have been reusing for multiple years. In fact, LED lights use about 70-80 percent less energy than the traditional incandescent bulbs and last about 10 times longer. Also, since they run cooler, they are much less of a fire hazard than traditional Christmas lights. If you would like to learn more about how much you can potentially save by making the switch to LEDs, you can check out the Holiday Lighting Calculator from Duke Energy. Some utilities even now have online marketplaces where you can buy energy-efficient holiday lighting at a substantial discount! Around the holidays, people are generally enticed into purchasing items they wouldn’t on a regular day. But with so many great deals on smart home gadgets and other energy-saving technologies during Black Friday and the rest of the holiday season, why not buy some new tech that will save you some time and money? Smart home devices, including smart thermostats, smart appliances and smart blinds, install easily and make common household tasks much easier. I mean, what could be simpler than managing your lights or blinds remotely via a smartphone or tablet? But not only do these products improve the comfort and convenience of your home, they also can improve your home’s energy efficiency and, hence, help save you considerable money. A smart thermostat itself can save the average customer between $150-200 a year on power bills, and adding things like smart power strips and smart lighting will save you even more! Improving your home’s energy efficiency doesn’t just come from purchasing new technologies. In fact, one of the most beneficial things you can do just requires a few hours of your time. Even if you have the newest smart thermostat, it won’t make much an impact if your home is leaking cool or warm air. Air leaks can drain energy from your home, but good news, they can be easy to remedy yourself. To learn how to do this with caulking, check out the Department of Energy’s instructions here. Just by completing these steps, you could save up to 10 percent on energy costs this holiday season. Adding weather-strips is another means of sealing the air leaks around certain areas such as windows or doors. Weather-stripping is also easy to find at home improvement stores for a good price, and the Department of Energy suggests adding weather-strips can save an additional five to 10 percent on your home’s heating and cooling costs. There are many other DIY projects you can do to improve your home’s energy efficiency around the holidays. When done consistently, these home improvements can save up to 15 percent on your power bill without much cost to you! The holiday season is a time to relax and enjoy spending time with family and friends, but with just a few small changes, you can also make some serious improvements in your home’s energy efficiency. Get started as early as Black Friday, and then make a New Year’s resolution to be smarter about your energy use in 2019! Want to learn more about the exciting changes coming to the world of energy and how they might benefit you? Check out our latest video here on YouTube!